Nails have their place in construction but rarely work best when it comes to hanging heavy paintings, photos or decorative works on the wall. Unless it's secured through drywall into a stud, the weight of the hung item can cause the nail to pull out, bringing a bit of drywall with it. Avoid using nails altogether to avoid having issues with them. Instead, hang heavy items with molly and toggle bolts or with screws secured directly to studs to keep them safely in place. 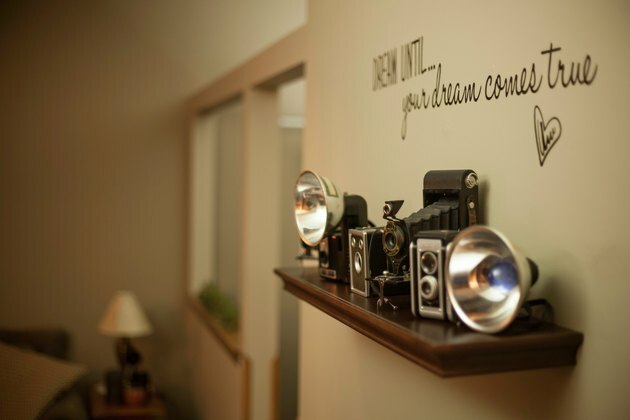 Before you can hang anything on the wall, choose the spot where you want to hang the item. 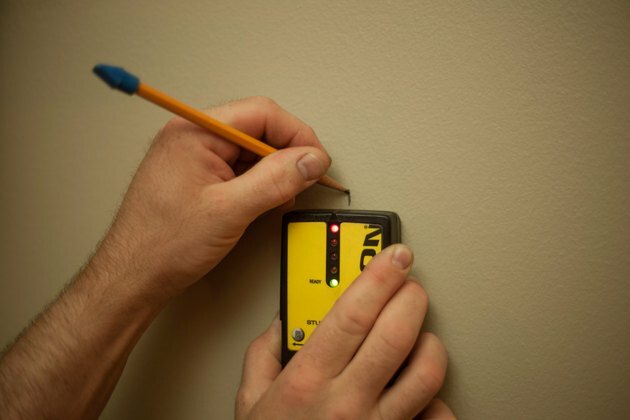 Locate the studs behind the drywall with a stud finder to see if you can use a wood screw to secure it to the wall. 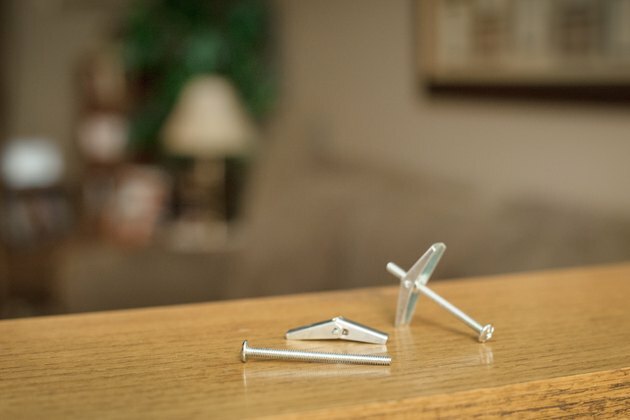 Wood screws secured through drywall into a stud provide strong support for heavy objects hanging on the wall, but the screws must be stout enough for the job; drywall screws and other thin-shanked fasteners are weak and brittle and can snap off when installed or when loaded with heavy weight. If there are no studs where you want to hang the item, use molly or toggle bolts with an appropriate weight (load) rating for the item. Mark the spot on the wall where you want to put the appropriate hanger. Note: For mounting very heavy objects to drywall or plaster surfaces, use wing-type anchors or heavy-duty toggles designed for grab bars. These specialty hollow-wall anchors typically offer much higher load ratings than standard toggle and molly bolts. Molly bolts are much easier to install than toggle bolts, and you can remove the screw as many times as you want. Molly bolts work well for hanging towel racks to keep them in place against the wall, or for shelf brackets that support a lot of weight. The package the molly comes in should list the weight ranges it supports. Never use a plastic anchor bolt to hang something heavy. 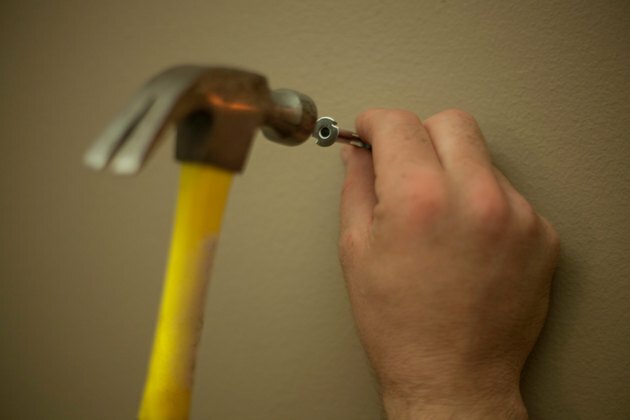 To install a molly bolt, remove the screw from the metal collar; drill a hole, and tap the bolt into the wall with a hammer. Attach your hanger to the bolt shaft and then screw the machine bolt into the collar. As the bolt tightens, the collar inside the wall flares out to hold the collar against the inside of the drywall. Install a toggle bolt into the wall when you want to hang a heavyweight object, such as a large mirror. Metal toggle bolts have a spring-loaded set of wings affixed to a small nut that threads onto a bolt that holds the hanger. Slip or thread the hanger onto the shaft of the bolt, and screw the bolt into the nut between the wings so that the wings are within 1/8 to 1/4 inch from the end of the bolt. Squeeze the wings to pass them through the predrilled hole in the wall. Once they are inside the wall, pull on the bolt as you turn it clockwise with a flat-head screwdriver. This keeps the wings flat against the inside of the drywall so the bolt turns in the small nut perched between the wings. Use two toggle bolts to hang heavy items. If you remove the bolt, you'll need to replace the wings -- they fall to the floor inside the wall once you remove the bolt. 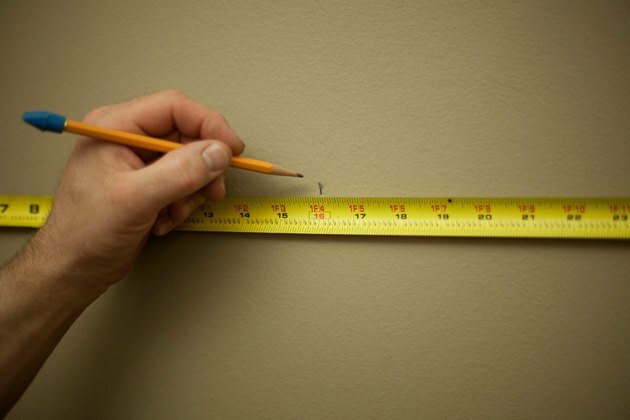 One of the most secure ways to hang heavy items begins with locating the studs inside the wall with a stud finder, and then marking them where you want to add a screw. Once you know the stud's location, you can hang a heavy object on screws secured tightly to the wood. Choose wood screws that are at least 1 1/2 to 3 inches long, as they need to be long enough to pass through the drywall -- typically 1/2 to 5/8 inch thick -- and bite sufficiently into the stud for an inch or more. Studs typically sit 16 inches apart on center, with the narrow sides against the back of the drywall. You can use picture hangers and plastic anchors to hang small or lighter weight photos or pictures. Don't use them for towel racks, which can pull away from the wall, especially if people put weight on the bar. 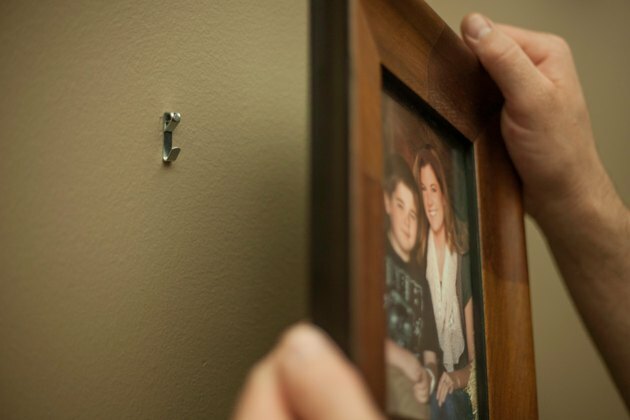 Picture hangers have little metal hooks through which a small nail passes into the drywall. The single nail hangers generally can support a picture or item up to 25 pounds, while a two-nail hanger can take up to 50 pounds, but avoid maxing the weight limit on them if you don't want items falling off the wall after being bumped or simply loosening over time. Opt for molly or toggle bolts instead.